Drill bits are useful cutting tools. They come in a huge range of sizes, shapes, and purpose. It is so convenient to own several different kinds of drill bits for simple home repairs to do it yourself projects. But in order for them to be effective, they must be sharp. Dull bits are dangerous to work with. They do not get the job done and they cause accidents. That is why you must learn how to sharpen a drill bit. 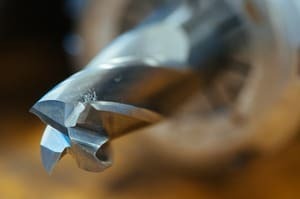 What is the Best Angle to Sharpen a Drill Bit? Any experienced drill bit user can sharpen a standard drill bit by hand. It should be held with a shank angled at about 59 degrees to the left for best result. As the bit touches the grinding wheel, tilt the shank simultaneously farther left and downward, as you twist it clockwise. 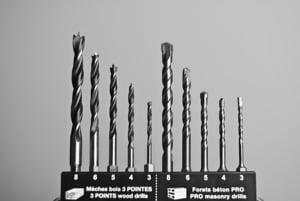 Investing in drill bits can be expensive but it is a good decision. However, they wear out too after several uses. It can save you money if you sharpen your drill bits rather than replace them with new ones. To make the job easier, you can purchase a bit sharpening tool with a sharpening guide. You won’t have to worry if you have drill bits of different profiles. Most commercial sharpening tools accept drill bits of different profiles. Here are some tips you can use when sharpening drill bits with a sharpening tool. If you have drill bits of a 59 degrees profile on the cutting edge, use the sharpening guide and set it to the same degree. Tighten the thumbnut. The sharpening tool has a small tip dedicated to the edges of the drill bit’s flutes. Rest the flutes against it. You may have to lower or raise the tool’s tip against the bit’s flute to make sure the edges fit properly. Drill bits have different cutting edges and overhang. You must start by making the overhang equal to the radius of the drill bit. This matters because if you fail to adjust accordingly, you may damage your sharpening tool and the drill bit may result in being too flat. The ideal cutting edge angle is to have the shortest cutting edge possible. Between the low points of the fluting, the edge should run between it. If the bit is close to ideal, it will cut the steel more efficiently. After setting the overhang, turn the screw that clamps the drill bit in the sharpening tool’s trough. Set the sharpening guide according to the length of the drill bit you want to sharpen. Make sure the end of the bit is movable in the tool’s trough and not just hanging in the air. Find the colored metal nut and loosen it. Adjust the rear nut and tighten the metal colored one. The tip of the drill bit should be equal with the center of the motor shaft. For grinding, you can use a radial arm saw. While sharpening, it is better for the drill bit to kiss the grinding wheel. Remember, if it is too close, you will lose more material than necessary. It would be very difficult to sharpen and the bit will become hot. The sharpening tool’s base should be square to the grinding stone. Start the grinding motor and swing the bit’s tip to the right. Keep turning and rotating the tool to sharpen the bit. Sharpen one side first and then the other. Make sure the motor and wheel are off for safety. Repeat the process if necessary. Make sure the flute of the bit rests on the sharpening guide’s tip. A properly sharpened drill bit should have no rounded, worn out edges. It should be sharp and crisp. You can make wooden blocks to serve as your guide when you need to sharpen small drill bits. If you have a bench grinder sitting in your garage or work area, you do not have to buy a sharpening tool. You can sharpen your drill bits freehand. Hold the bit and make sure the cutting face is parallel to the grinding wheel. Bring the drill bit in contact with the wheel as straight as possible. The heel side of the bit should be ground a little bit more than the edge. Ready a basin of water next to you to cool the drill bit when it gets too hot while grinding. As soon as you get your desired sharpness of the cutting edge, check if the widths are the same. The two edges should almost intersect to form a point in the center of the bit’s diameter. If both cutting edges of your drill bit are sharp, centered, and have the same width, then you did a good job! You can now sharpen your own drill bits in the future. If you need to check, hold the tip of the drill bit against a chunk of wood. Turn it slowly by hand. It should easily make a hole, without putting in so much pressure. Clear the shavings and chips packed into flutes as often as you drill. If you don’t, the drill will become too hot, which will only dull it faster. Use gloves and glasses for your safety. Watch this short video to get a better idea on how to sharpen a drill bit. Once you mastered how to sharpen a drill bit, you do not have to spend a lot of money to replace your worn out drill bits. You can either use a commercial sharpening tool or a bench grinder. Just make sure to use caution to avoid any accidents.